Pavlos has been a passionate mountaineer holding a professional Mountain Guide title. 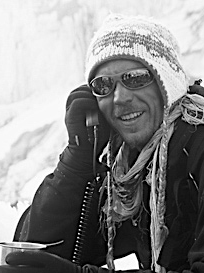 He has accomplished many expeditions all over the world and in 2004 achieved to reach the summit of Everest, as the Deputy Leader and filmmaker of the first successful Hellenic expedition. He studied Mass Media Communication and Film Directing and produced some award winning documentaries. However, what struck him most are the live scenarios: climbing a snowy ridge on an eighthousender, guiding people in the wilderness, mixing sound and images in a film studio, inspiring audiences at TedX or designing new trips for active travelers.